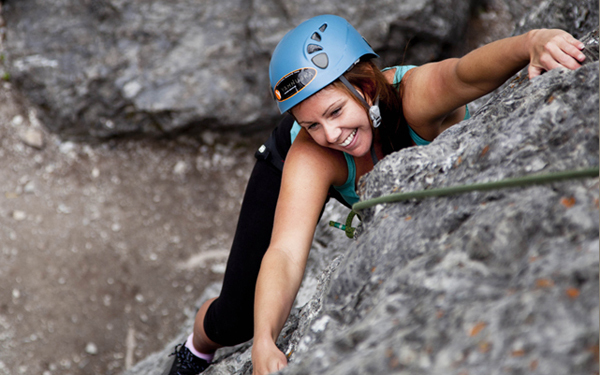 Rock climbing is an exhilarating sport and our beginner rock climbing course is a great way for you to get started. 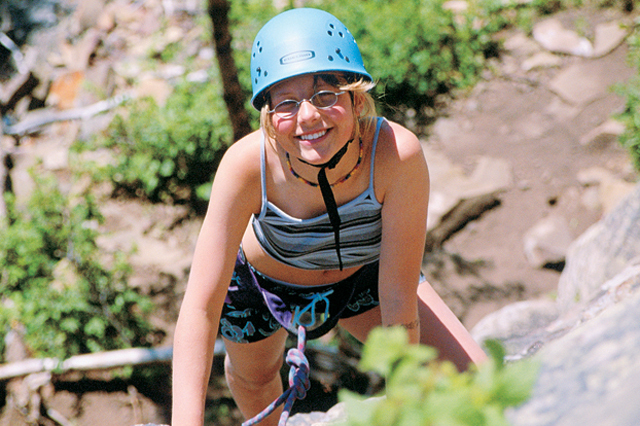 As the foundation for many other types of mountain climbing trips learning to rock climb is essential for future skill development. And where better to learn than the Canadian Rockies! 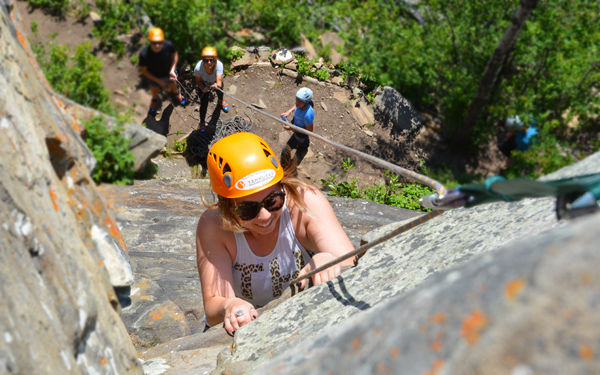 The Canadian Rockies surrounding Banff, Canmore and Lake Louise offer seemingly endless opportunities for beginners to get the skills they need to continue rock climbing. 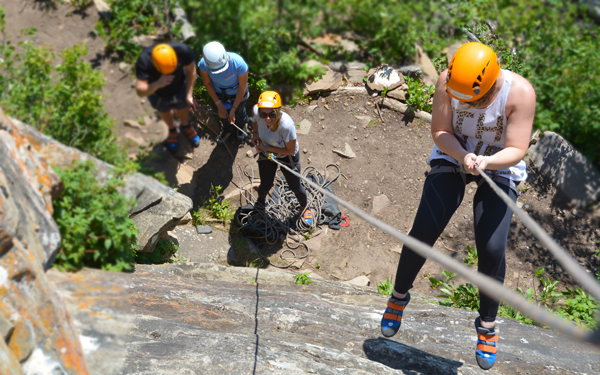 The Outdoor Rock Intro beginner rock climbing course is designed for those who have never climbed before or who have done some basic climbing either in the gym or outdoors. 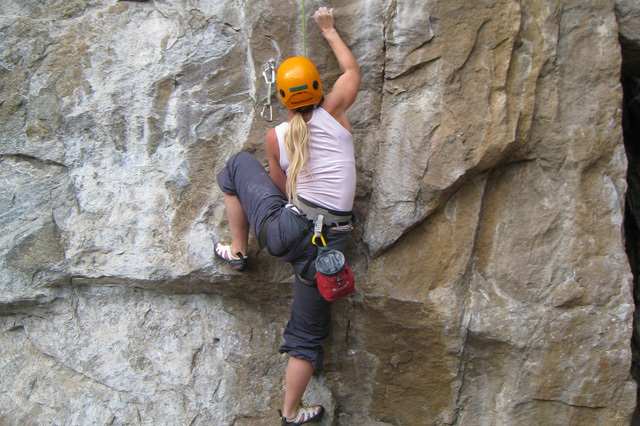 In this outdoor rock climbing course for beginners, you will learn foundational climbing movement skills and top rope techniques for rock climbing outdoors. 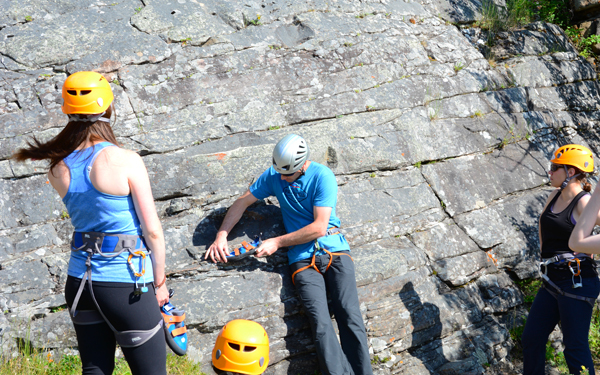 An introduction to the skills necessary for seconding on both sport and ‘trad’ multi pitch climbs is also covered in the outdoor rock climbing course for beginners so you can immediately start climbing with more experienced climbers. Developing these skills early on will allow you to progress at a quicker rate and you will likely find climbing much more rewarding. You will be taught and coached by our very talented and certified guides delivering our well established curriculum. Like any technical sport, learning proper skills and techniques early will ensure you develop good habits versus bad ones. 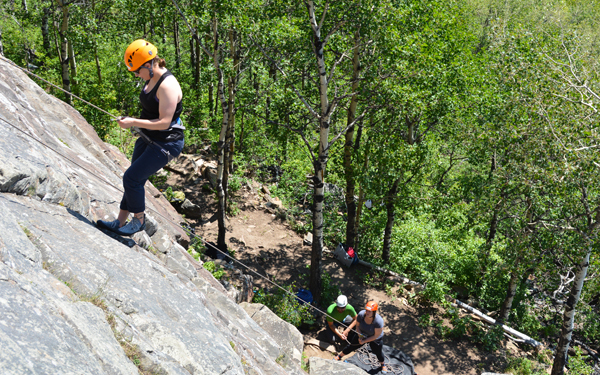 Sign up for our ‘Plus Day’ on optional Day 3 of the rock climbing program for beginners where you can join a guide led team to climb one of the many great multi-pitch climbs in the region. We use a variety of locations on this program. These include the Yamnuska “Practice Cliffs”, Zygote Buttress near Exshaw, Wasootch Creek in Kananaskis Country, Rundle Rock at Banff or, one of our favorites, ” Back of the Lake” at Lake Louise. 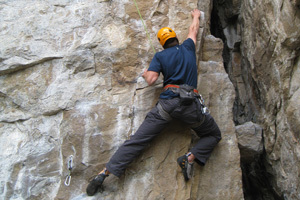 They are all great beginner rock climbing areas in beautiful mountain locations. Stay for an extra day where you can join a guide led team to climb one of the many great multi-pitch climbs in the region.and put your new skills into practice. The instructor to student ratio is 1:2. We divide into compatible teams, choose a suitable ‘multi-pitch’ route (several rope lengths in height) and spend the whole day climbing it. Climbs include routes on Mt. Yamnuska, Kid Goat Buttress, Tunnel Mountain and Cascade. $280 plus GST. Available every Monday following ‘Outdoor Rock Intro’. The course begins at the Yamnuska office at 8:00am on Day 1. 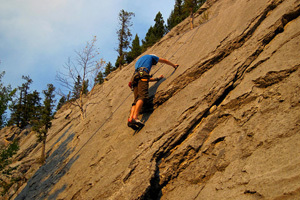 The Yamnuska office is located at #200 – 50 Lincoln Park, Canmore. See this map for location. 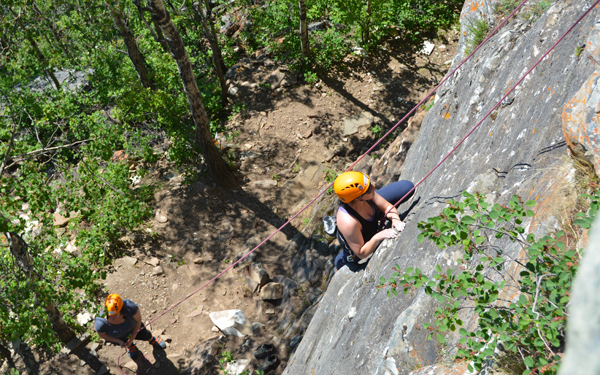 Enthusiastic and extremely talented, your instructors hold rock climbing or alpine certification from the Association of Canadian Mountain Guides. Our instructors are chosen not just for their technical climbing virtuosity but also for their ability to instruct and coach. Instructor to student ratios range down from 1:6. On “Plus” days 1:2 is the norm. Minimum group size is 3. Food is not supplied. You will need lunch, energy snacks and plenty to drink each day. We recommend a minimum of 1 L of fluids per day, more if it is hot. $425 CDN covers instruction and use of technical gear. Accommodation and meals are not included but low cost, easy options exist which we can tell you about. Goods and Services Tax (GST) is extra. This course is designed for: People who have never climbed before, have minimal experience or are basic indoor gym climbers. If you are an indoor climber who climbs 5.9 or greater and you are leading or feel ready to lead you should consider our ‘Rock 2 – Learn to Lead’ course. 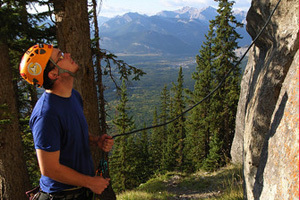 Yamnuska guides and instructors are also available for private guided rock climbing instruction.